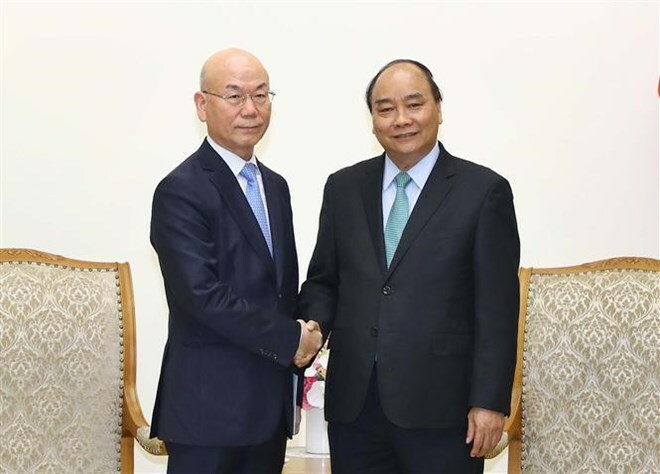 Hanoi (VNA) – Prime Minister Nguyen Xuan Phuc proposed that media outlets of Vietnam and the Republic of Korea (RoK) give adequate space to promoting each other’s nation, while meeting with Lee Hyo-seong, Chairman of the Korea Communications Commission (KCC) in Hanoi on March 26. PM Phuc noted that Vietnam and the RoK share many similarities in culture and history, which is an important factor for connections between the two peoples and a building block for both sides to promote bilateral partnership, including in information and communications. The PM said that Vietnamese TV channels have given much airtime to Korean films, which has familiarised Vietnamese people with Korean culture and lifestyles, and thus creating new cultural values amongst youngsters in Vietnam. The Government of Vietnam highly values the signing of a cooperation agreement on TV programme production between the KCC and Vietnam’s Ministry of Information and Communications, he said, expressing his hope that the two sides will work closely to realise the deal, thus promoting understanding and friendship between people of both countries. The Vietnamese Government and people will work hard to develop the bilateral ties, especially through the strengthening of cooperation in broadcasting, he said. The Government leader proposed that the RoK side support the airing of Vietnamese radio and TV programmes introducing the culture, nation, and people of Vietnam on its media broadcasting outlets. For his part, Lee Hyo-seong noted that the number of Korean tourists visiting Vietnam has surged over the past few years. He also conveyed his delight at the development of Vietnamese football under the coaching of RoK national Park Hang-seo. Thanks to the strong sporting bond, mutual understanding between people of the two countries has been improved significantly, he stated. Holding that the increase in the number of Korean investors in Vietnam reflects the growing partnership between the two countries, Lee pledged to work harder for stronger communications, especially broadcasting, contributions to the development of the strategic partnership. PM Phuc said that he hopes Vietnam will witness a new wave of investment from the RoK across all fields, and that it is committed to creating optimal conditions for Korean firms in Vietnam. Vietnam has designed various preferential conditions for Korean businesses and citizens in the country, he said, adding that the two governments are determined to raise bilateral trade to 100 billion USD and even 150 billion USD in the future. Vietnam hopes to serve more Korean tourists, he said. The leader declared that the Vietnamese communications sector, especially broadcasting agencies, will work closely with the RoK media in the future. He suggested that the two sides set up a joint working group to build specific action plans to ensure efficiency of their agreement. He also affirmed Vietnam’s wish to contribute to the building of peace and stability in the Korean Peninsula.